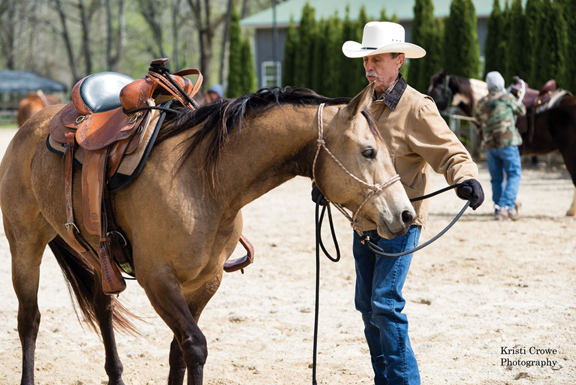 On April 19, 2018 Ken McNabb came to Lynnville, Tenn. for a three day horsemanship clinic, held in the spacious outdoor arena at the Circle G Guest Ranch and Event Facility. 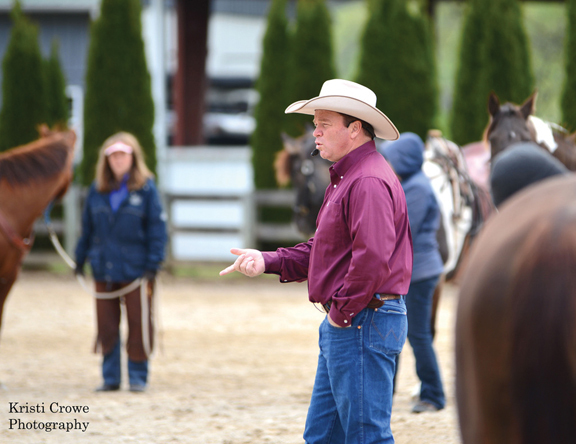 Ken welcomes all levels of riders and horses to his clinics, with the goal of teaching the participants as much as he can in the three days they work together. The ultimate goal is building a good foundation and solid trust between the horse and rider. This clinic attracted 15 horse and rider participants, with the majority of horses in western tack. All the horses wore some type of rope halter for the ground work. Some of the riders had ridden in Ken’s clinics previously; some were there for the first time. Ken began the clinic with one basic rule: Don’t get hurt! Accidents can happen, but the riders should ask themselves: Can I get hurt if I do this with my horse? Can my horse get hurt? If the answer is yes, Ken instructs the riders not to do it. There is nothing worse than taking your horse to a clinic where it gets hurt. Ken pointed out that, even if you think you ride a lot, in a clinic you realize you don’t ride as much as you thought. More than likely, after three days of riding, the horses and riders will be sore. Ken covered topics such as horse leadership through solid ground work and riding cues, focusing attention from the horse to the rider, and longe work. Riders often longe their horse to “get the buck out” and think they are good to ride afterwards. Realistically, the horse needs to be focused on the rider, who is the leader. They must form a good foundation of solid trust, with the horse responding to the cues. The rider should use them minimally at first, so there is room to increase the aids if the horse does not respond the first time. If the rider constantly nags at their horse, continually correcting the horse, the horse will not learn to listen and will simply ignore the cues. The key is: use minimal cues, wait about 2 seconds, and then ramp up the cues as needed for immediate response. 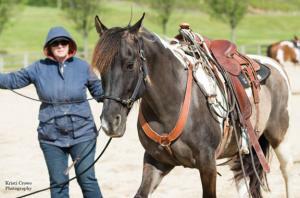 Horses learn from a steady progression in training. You cannot skip around in your training and expect the horse to understand. Be consistent. Be fair. And above all, be the leader. In the first exercise, the horses were moved to the right or left with hand and shoulder movements. Each rider used encouragement with the end of the lead rope positioned at the horse’s rump to gain forward movement. 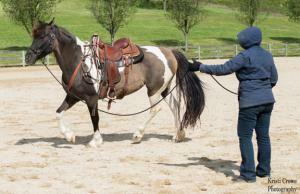 The goal was to get the horse moving around the rider in a soft, relaxed manner, not pulling on the lead. Each participant was instructed to change directions often, wait 2 seconds, and ramp up the cue until the horse understood and went in the other direction. 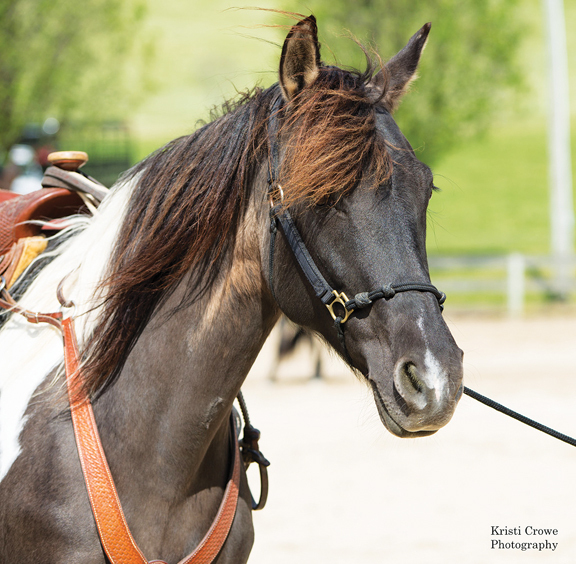 When the horse was focused on the rider and consistently following cues, it was time to work on moving the hindquarters while the front stayed still. Stepping to the shoulder, gently holding the head with the lead rope, the participants raised their other hand toward the rump and told the horse to move around. If the movement was not performed in 2 seconds, they were instructed to flick the end of the lead at the rump until the horse responded and moved. This was repeated in both directions until the horse responded with no delay. The next step was to teach the horse to side pass away. Once again, the participants stepped to the shoulder, gently held the head to tell the horse to not to go forward, and told the horse to move away by holding their other hand towards the hip. Ken said to look for the front legs to cross over as the horse moves away. As before, repeat in both directions until there is no delay when the subtle cue is given. When the horse is focused on the rider, you do not have to have a strong hold on the lead rope to have the horse move where you tell him to. 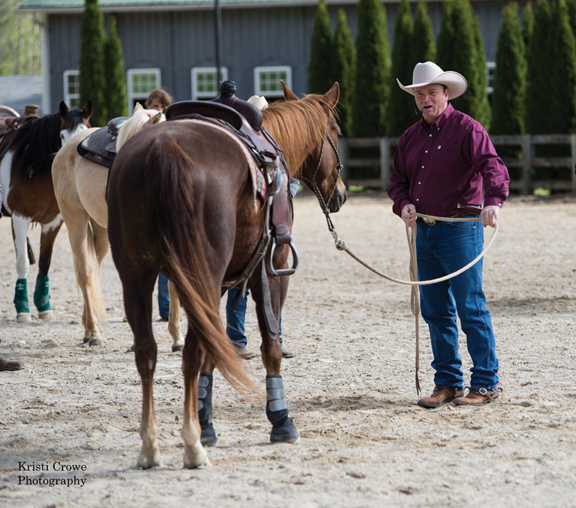 Ken told the participants that they are dancing with their horses, moving them around with cues, and their horses should learn to read the intent and follow through. Many times people work their horse until they do something right and then stop so that the horse knows that was the proper action. But many times the horse did it right purely accidentally. The key is to keep working on the same lesson until the horse understands the lesson and does it every time the cue is given. 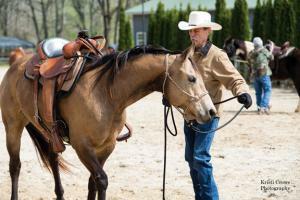 Ken says, “Keep working the exercise until the sweat is dry and the horse has learned the lesson.” But don’t expect just one training session to be enough. The next day, be prepared to work on the same lesson. If the horse responded with minimal cues, the lesson was learned. As each participant worked with their horse, Ken walked around and offered suggestions or assistance. One of the participants, Jerry Apfel from Covington, Tennessee, asked Ken for assistance with his mare, Biscuit. Jerry said that Biscuit was a very athletic horse, but didn’t listen to him until she was hot and sweaty. As Jerry gave the cues for Biscuit to change direction, she would spin around and take off in the other direction; nothing was slow and soft with her. Ken worked Biscuit for about ten minutes until she started to pay attention to him. Jerry then took over, and the change in his mare was quite noticeable. A few other riders had the problem of their horse not moving around them in a round circle; the horses’ shoulders were towards the rider with the hind end out. Ken instructed the riders to move their horses’ shoulder off them. It appeared that everyone enjoyed the clinic and the lessons learned. Even though the first day of the clinic was cloudy and blustery, that didn’t dampen the enthusiasm of attending Ken McNabb’s clinic. Circle G Ranch owner, Kimber Goodman, provided home cooked meals for the participants in the gorgeous main dining room.